This guide will discuss how Android 6.0 supports app-linking, a technique that allows mobile apps to respond to URLs on websites. It will discuss what app-linking is, how to implement app-linking in an Android 6.0 application, and how to configure a website to grant permissions to the mobile app for a domain. Mobile applications no longer live in a silo – in many cases they are an important components of their businesses, along with their website. It's desirable for businesses to seamlessly connect their web presence and mobile applications, with links on a website launching mobile applications and displaying relevant content in the mobile app. App-linking (also referred to as deep-linking) is one technique that allows a mobile device to respond to a URI and launch a mobile application that corresponds to that URI. An existing app is already associated with the URI – The user may have already associated an existing app with a URI. In that case, Android will continue to use that application. No existing app is associated with the URI, but a supporting app is installed – In this scenario, the user has not specified an existing app, so Android will use the installed supporting application to handle the request. No existing app is associated with the URI, but many supporting apps are installed – Because there are multiple applications that support the URI, the disambiguation dialog will be displayed and the user must select which app will handle the URI. If the user has no apps installed that support the URI, and one is subsequently installed, then Android will set that application as the default handler for the URI after verifying the association with the website that is associated with the URI. This guide will discuss how to configure an Android 6.0 application and how to create and publish the Digital Asset Links file to support app-linking in Android 6.0. This guide requires Xamarin.Android 6.1 and an application that targets Android 6.0 (API level 23) or higher. App-linking is possible in earlier versions of Android by using the Rivets NuGet package from the Xamarin Component store. The Rivets package is not compatible with app-linking in Android 6.0; it does not support Android 6.0 app linking. Adding one or more intent-filters for the website URI's – the intent filters guide Android in how to handle a URL click in a mobile browser. Publishing a Digital Asset Links JSON file on the website – this is a file that is uploaded to a website and is used by Android to verify the relationship between the mobile app and the domain of the website. Without this, Android cannot install the app as the default handle for URI's; the user must do so manually. Categories – The intent filter should register both Intent.CategoryBrowsable and Intent.CategoryDefault to be able to properly handle the web URI. DataScheme – The intent filter must declare http and/or https. These are the only two valid schemes. DataHost – This is the domain which the URIs will originate from. DataPathPrefix – This is an optional path to resources on the website. AutoVerify – The autoVerify attribute tells Android to verify the relationship between the application and the website. This will be discussed more below. Android will verify every host that is identified by the intent filters against the Digital Assets File on the website before registering the application as the default handler for a URI. All the intent filters must pass verification before Android can establish the app as the default handler. 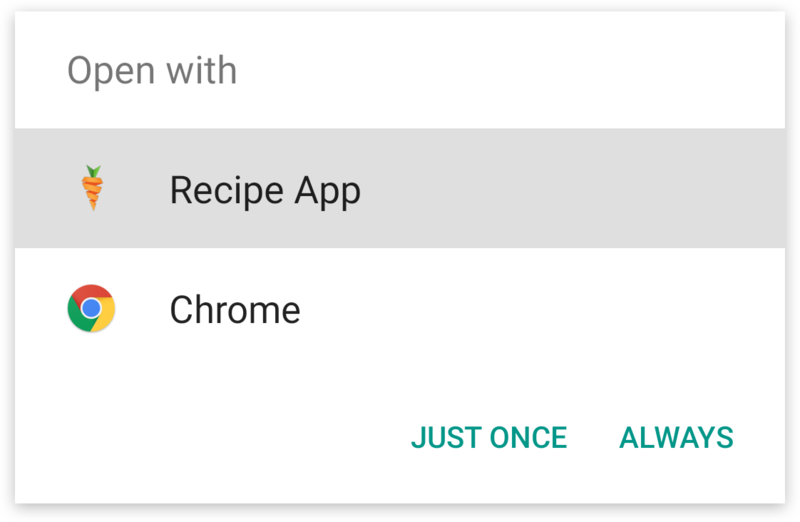 Android 6.0 app-linking requires that Android verify the association between the application and the website before setting the application as the default handler for the URI. This verification will occur when the application is first installed. The Digital Assets Links file is a JSON file that is hosted by the relevant webdomain(s). The android:autoVerify attribute must be set by the intent filter – otherwise Android will not perform the verification. The file is placed by the webmaster of the domain at the location https://domain/.well-known/assetlinks.json. namespace – the namespace of the Android application. package_name – the package name of the Android application (declared in the application manifest). sha256_cert_fingerprints – the SHA256 fingerprints of the signed application. Please see the guide Finding your Keystore's MD5 or SHA1 Signature for more information on how to obtain the SHA1 fingerprint of an application. The Google Digital Asset Links website has an online tool that may assist with creating and testing the Digital Assets file. After implementing app-links, the various pieces should be tested to ensure that they work as expected. Package – The package name of the application. Status – This is the current link-handling status for the app. A value of always means that the application has android:autoVerify=true declared and has passed system verification. It is followed by a hexadecimal number representing the Android system's record of the preference. This guide discussed how app-linking works in Android 6.0. It then covered how to configure an Android 6.0 application to support and respond to app links. It also discussed how to test app-linking in an Android application.